Home > Facials in Pittsburgh - The Best! Organic facials in Pittsburgh are now available at Pure Skin Care Center in Robinson Township. Facials using Eminence Organic skin care products. Pure Skin Care Pittsburgh brings you affordable luxury. Pittsburgh Facials at Pure Skin Care Center: What makes Eminence organic products different? Eminence Organic skin care is made with fresh natural fruit pulp, exotic spices, and plants. Products used for organic facials contain blends of fruit, vegetables, natural oils, etc. 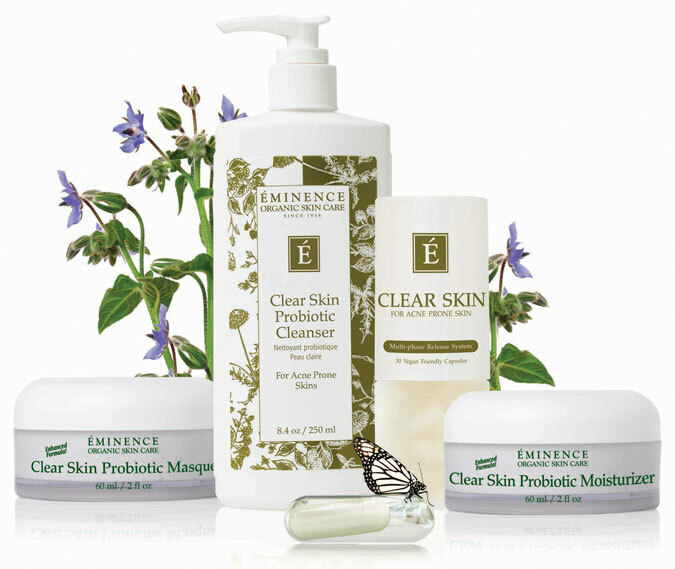 Is Eminence organic skin care paraben and preservative free? Eminence certified organic skin care uses organic ingredients are hand picked and hand mixed in small batches, combined with thermal hot spring water to create skin care that contain potent beautifying and healing properties, free of chemical preservatives. Facials in Pittsburgh - What types do you offer? We offer customized facial treatments for all skin types, including acne prone, aging, or pigmented skin. We also offer an "Express" facial that will keep your skin looking great in between visits. One of our popular services is a combination facial with diamond tip microdermabrasion. Facials - can they help with my acne? Eminence Organic skin care has a specific line to address the needs of our acne prone clientele without harsh chemicals. We are also happy to announce the addition of FDA approved Celluma Blue LED Light Treatments that you may add to your organic acne facial for an special price of $20 when done at the time of your facial. Blue LED light therapy is FDA approved to help kill the acne bacteria. New Client Special: for a limited time, Pure Skin Care Center is offering your first microdermabrasion treatment with a complimentary organic mini facial for $49, a savings of $31 over our regular price of $80. To book now online, click here. Clear Pore Refining acne treatment facial includes deep cleansing steam, exfoliator, mud mineral or charcoal masque for deep pore cleansing, facial massage with hydrating gel and application of non-pore clogging mineral SPF. 30 minutes. $45 (If extractions are needed, please choose our "Healthy Skin Facial with Extractions" below). Exfoliation add-on to any facial service. A guided tool activated by ultrasonic soundwaves (28,000 vibrations per second) lifts debris out of pores and infuses nutrients deep into the skin. Clears out clogged pores and used in crevices such as in the chin or sides of the nose to remove dirt, old oil, and even blackheads. Often called "soft peeling". There is little to no redness or downtime with this treatment. $20 (add-on only). Upgrade any facial service. This add-on ultrasonic service is gentle, non-invasive. and suitable for most skin types. Ultrasonic soundwaves (28,000 vibrasions per second) lifts debris from pores. The flip side of the spatula provides an intense micro-massage to heat the skin tissue, stimulating blood flow, and help rejuvenation serums penetrate into deeper levels of skin tissue. Your skin will have that lit-from-within glow, making it the perfect treatment before special events. $35 (add-on only). Can I add Microdermabrasion to my facial? Yes you can! Just let us know when scheduling your appointment so that we may schedule the correct amount of time. The cost to add-on a microdermabrasion to your facial is $30.